Here’s a fun craft your boys will love. My boys have talked me into buying them all sorts of colors and patterns of duct tape, and I keep finding it all around the house. I realized it was time to do something with it. Then I remembered how to make a Magic Duct Tape Wallet. No matter which way you open it, your money is always magically there. What kid doesn’t like magic? My boys definitely do, and they thought these wallets were awesome. You can use the following tutorial to make your own Magic Duct Tape Wallet. Follow the steps to make your Magic Duct Tape Wallet. Step 1: Cover both pieces of cardboard on both sides with duct tape creating each half of the wallet. You can use two different colors of duct tape if you’d like. Also make 4, six inch strips by folding in half 2 pieces of duct tape and cutting them in half. Step 2: Lay the two pieces of covered cardboard next to each other and then place two of the strips in an X across the right piece of cardboard. Step 3: Holding the X in place, turn the wallet piece over. You will see all four strips sticking out. 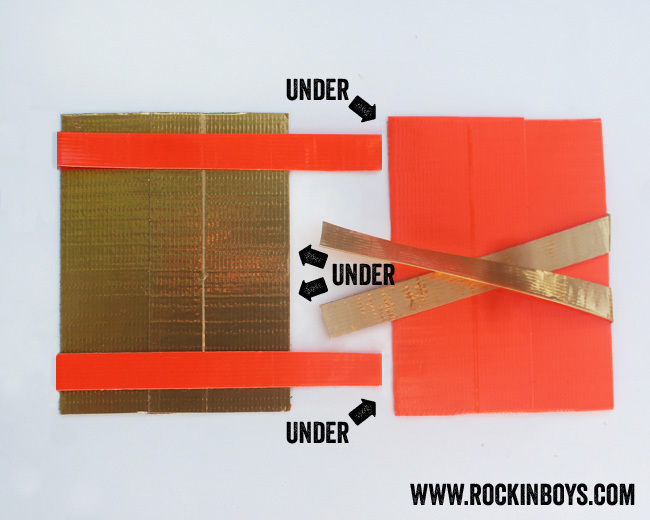 Bend the left two strips over to the back of the wallet piece and affix with another piece of duct tape. Turn wallet piece back over. Step 4: Place remaining two strips across remaining wallet piece as seen below. Affix those two strips to the back with another piece of duct tape. Turn wallet piece back over. Step 5: Lay the wallet pieces side by side as seen below, making sure the strips are folded over towards the middle. Now carefully make the loose ends of the strips push under the opposite wallet piece. Step 6: Carefully turn both wallet pieces over and tape the remaining 2 strips on each side with another piece of duct tape. Step 8: Fold up a dollar and place in one side of the wallet, and your ready to see your magic wallet in action. Now you can open your wallet from each side and see the money transfer from side to side. How cool is that! It is a little tricky, so if our tutorial isn’t clear enough, I suggest looking up a video tutorial on youtube. One of the photos was missing for some reason. Does it make sense now?